Stealthed, so I will not die immediately. 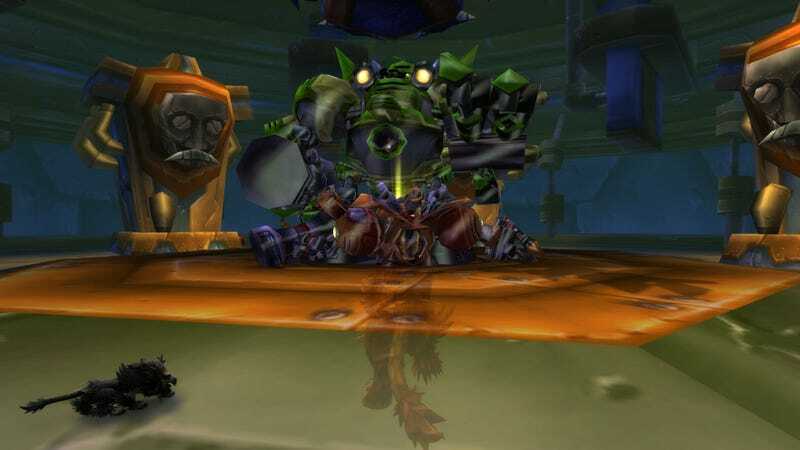 More players are dying in the depths of World of Warcaft’s Gnomeregan dungeon than there’ve been in years, thanks to the revelation of a ridiculously powerful new boss tucked away in its depths. Say hello to Endgineer Omegaplugg, and then goodbye very quickly. The recently-introduced uberboss has has been making the rounds over the past couple days, ever since Redditor Nexeoes revealed how to summon him, but I had to see for myself. Gnomeregan has always been one of my favorite World of Warcraft dungeons, because gnomes are the absolute best. In order to summon the Endgineer, the player or players in the dungeon must be level 110 (I tried it with my 104 hunter, and it did not work). Head down to where the final boss of the dungeon, Mekgineer Thermaplugg, spawns, and do away with him. Once he is a corpse, check behind the first column on the left after entering the area to find a button marked “Push Me!” Push it. Push it real good. According to reports and videos, like the one below from YouTuber Asmongold, he hurts quite a lot, with plenty of AOE and bombs spawning and other nonsense. Once killed he drops a Vial of Gree Goo, a toy that transforms the user into a leper gnome, which aren’t nearly as good as the normal variety. I use Asmongold’s video for reference, as I took a swipe at him on my mythic-geared Druid and lasted less than a blink. His one hit got me for 1.6 million damage, AKA enough damage. It’s lovely to see Blizzard using old instances and areas to tuck away secrets like this, or the robot wolf waiting for the right tamer to come along down in the engineering section of Gnomeregan. It adds a little life to the areas that have otherwise been not much more than quick leveling stepping stones.